Yesterday, Greenpeace released a report titled, “Bad Influence: How McKinsey-inspired plans lead to rainforest destruction.” The report highlights how advice from McKinsey & Co., one of the world’s top consulting firms, will result in an increase in the destructive logging it is, in theory at least, supposed to prevent. [W]hen rainforest countries employ McKinsey to apply its trademarked cost curve to their REDD+ prospects, few if any of the resulting plans meet basic standards of accuracy, rigour, utility or ethical acceptability. If implemented in their current form, these plans could actually result in an increase of deforestation and carbon emissions. Cost curves for REDD+ are not able, and do not seek, to integrate the web of social and environmental values associated with tropical forests beyond their carbon sequestration and storage potential. MAC [Marginal Abatement Cost] curves treat tropical forests like a carbon abatement technology, rather than recognising them as some of the world’s most complex living systems, supporting a staggering variety of biodiversity, as well as being of great economic and cultural importance to humans. Comments from Jose Endundo, Environment Minister in the Democratic Republic of Congo, reveal two of the key problems with McKinsey’s advice on REDD to governments. First, McKinsey over-estimates the business as usual scenario, meaning that anything less than this nightmare vision can be counted as “avoided deforestation,” or “avoided threatened deforestation,” which is a speciality of Guyana’s President, Bharrat Jagdeo. Second, McKinsey under-estimates the impact of industrial logging on the forests. Oddly enough, McKinsey’s statement to Bloomberg disagrees with a statement put out by McKinsey on 9 March 2011 on the company’s Southeast Asia website. The statement, “McKinsey’s greenhouse gas abatement cost curve – setting the record straight,” is a response to Rainforest Foundation UK’s November 2010 critique of McKinsey’s advice on REDD. As a consequence, the abatement costs shown in the cost curve across a range of emissions reductions initiatives do not necessarily reflect the full costs of implementing those initiatives. Smallholder agriculture provides a good example. [I]mplementing this abatement initiative could be significantly more expensive than suggested by the cost curve as the transaction costs of addressing millions of farmers across a large geographic expanse would be substantial. I see that McKinsey is stuck in a dilemma – at least assuming only the best of intentions. In their statement, setting the record straight, they admit the shortcomings of the curve, saying that it is only an information tool, further informations have to be considered before taking decisions. Still, this curve is considered key to national low carbon development strategies, leading to the conclusion that these important national guidances rely on uncertainties and information gaps. I guess, this tool has been expensive to create and maintain, so the dilemma is the following: as one of many tools, the question would have to be raised, why a country should invest a lot of money in using it, while there are cheaper “bricks” of gathering significant informations for a national strategy. As key information source though, the investment would be reasonable. Not only McKinsey is hereby pressured to promote the curve from being only one tool to being the key tool, but also the politician who decides to invest into the utilization. If McKinsey continues making a secret of the data base of the curve and doesn’t allow experts to look into the comparability and consistency of the data, the scepsis will continue, no matter how hearty and positive public statements are. I personally would try to avoid using the tool as long as I’m not allowed to judge its quality – and therefore the ratio of cost and output. It’s also not helpful to point out that extensive stakeholder participation is necessary in the process of developing the strategy – but only allowing 3-6 months for this process, as happened in some countries. There is a copyright on the tool, McKinsey shouldn’t be afraid of making the background information available in a transparent way. Either it shows that the tool is unreliable and harmful – as many people tend to assume at the moment. 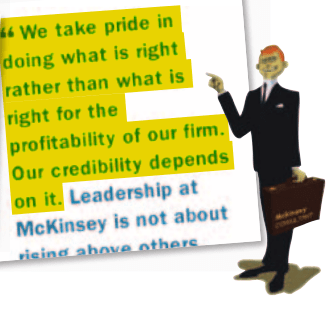 Or McKinsey is right to promote the tool as a flagship of their work and should have no constraints to prove it! Greenpeace are asking McKinsey to be like all good schoolboys and girls and show the workings behind their numbers, but they can’t or won’t do this. Not because of client confidentiality – often the clients themselves have told McKinsey consultants that they have under-estimated hugely the actual costs of carrying out projects in large and poorly governed countries – but because there is no standard methodology to expose. The cost-curve model is lucrative mirage built on sand. The standard McKinsey response to criticism is two-fold: first to say that critics overestimate the importance and influence of cost-curves, and second that all that McKinsey is doing is providing a “fact-base” from which decision-makers can take political decisions. However, they come unstuck on both counts. On the first, they are in a bind because on one hand they need to talk up the influence and importance of the unique and copyrighted methodology and how useful and successful it has been to many countries in order to sell their wares, and at the same time they need to talk down the influence and importance of the methodology to protect themselves from NGO criticism. If the cost-curve is so un-influential and not useful for informing policy, why should any governments bother to commission it? On the second, McKinsey’s numbers on subsistence agriculture and shifting cultivation that have been the subject of most criticism are overly reliant on one study from the Amazon from 2008. This study has been scaled up to give the cost for abatement of carbon from these activities at the global level and used to estimate the costs in quite dissimilar countries once they have been recalibrated according to cost of living. This is copy-paste disguised as research. Other figures are simply guestimates after interviews with people sitting behind desks in the capital. This in itself is not a problem if it is made clear how the numbers were arrived at, as accurate information often doesn’t exist, but it needs to be clearly stated along with the level of certainty, which no McKinsey report to date has done. 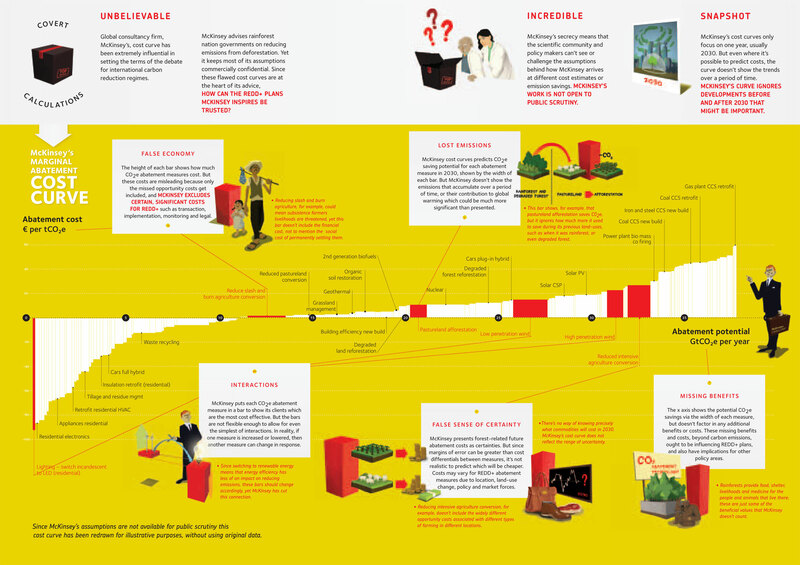 As a former University lecturer told me recently, “If my Masters students had produced work like this I wouldn’t have passed them, I’d have given them an E”. McKinsey only provide the appearance of a “fact-base” which donors can feel confident is a good basis for approving funding requests, and most times don’t actually speak to representatives of people who actually live in the forest. Let’s not allow this advice to derail genuine attempts to reduce deforestation and degradation in an equitable manner. If I am not mistaken, most of lucrative contracts under which McKinsey’s have peddled their sub-undergraduate cut-and-paste nonsense have been paid for either indirectly or directly by the Norwegian government. I wonder if Norway’s taxpayers will now demand a refund?? To pick up on Robin Webster’s comment briefly, I have just returned from Norway and I made a point of praising the actions of the Norwegian Government on every possible occasion. As the manager of a UN environmental project in Indonesia in the aftermath of Rio ’92, I was astonished to find that the only serious attempt to assess the environmental condition of Indonesia’s many crater lakes had been funded by Norway, and i am equally impressed that a small nation like Norway has again made THE outstanding bilateral contribution to preserve tropical forests. Let us give credit where it is due, and urge a few other governments to pick up the baton and support the work already done by the people of Norway through their generosity and concern for tropical forest and the governments which manage them.